Our Indian tribal tour reaches a new destination. This time we cover Abujmaria tribes of India. 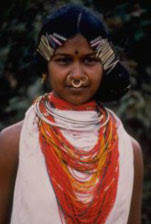 These Indian tribes can be seen in the mountain regions of Madya Pradesh. These tribes of India have a very deep history. In the earlier period Abujmaria tribes were known as Abudjamadis, Abujmariya and Hill Maria. These Indian tribes were considered as a sub part of the important gonds tribes (discussed earlier) who played a pivotal role in knowing the original Indian tribes. These tribes of India are generally found in Abujhmar Mountains and Kutrumar Hills in the Bastar district of Madhya Pradesh. These hills are at times inaccessible, but reaching there is a fun filled experience. They generally speak the Dravidian form of language, Abujmaria bein the native language of these tribes of India. Labels: abujmaria tribes of india, indian tribal tour., indian tribes, tribes of india.